My friend’s dog ran away yesterday afternoon around 1:30 PM in LeDroit Park/Bloomingdale near W & 2nd Street NW. We’ve contacted the Humane Society and everything, but I figured I would reach out to you and your readership, if possible. 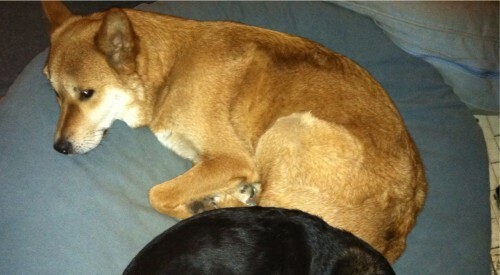 Her name is Sasha and we’re not sure of her exact breed, but she looks like a Shiba Inu mix — reddish blonde-colored and about 30 lbs. I’ve attached the best two photos I have. She is very sweet but rather shy/skittish, and likely will not seek out other people or come if called. She is wearing a collar and tags that as far as I know list her veterinarian in Bowie as the contact #. The vet is aware she is missing. Feel free to use wpindc(at)gmail.com or the contact # (202) 256-2991 if anyone has any information.